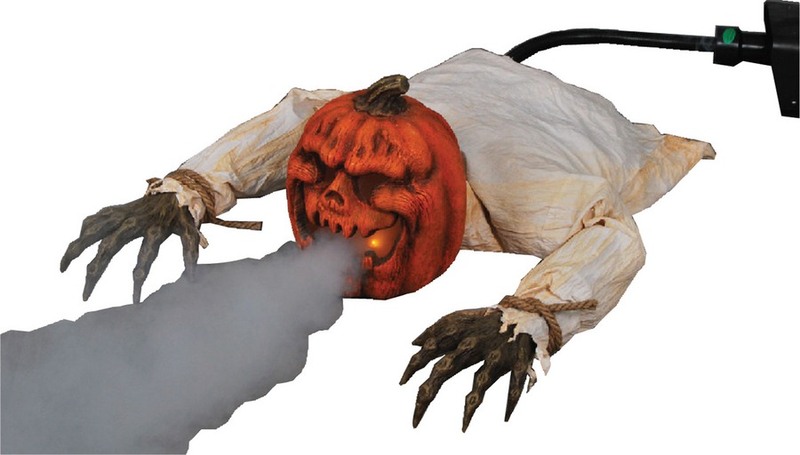 An Evil mutant Jack O' Lantern is crawling out from the grave spewing fog to get passers by! Features a plastic hand-painted 12''-tall evil Jack O' Lantern head, fabric shirt, two gnarly plastic hand-painted ''vine'' hands, and a 3'-long connector and hose attachment that fits onto most standard 400w & 700w fog machines (not included). Features stuffable shirt, with hands that extended forward. Pumpkin is 12 in tall, 9 in wide, and 7in deep. total length is approx. 30 in. Requires 2 AA Batteries (not included) to operate the LEDs inside the pumpkin, and newspaper to stuff the shirt.